Mrs. Awesome has a goal to see all 50 states before she turns 50. (See the symmetry?) Last year, only four remained - Florida, Vermont, Michigan, and Alaska. In the fall we knocked Florida off the list, flying into Fort Lauderdale, renting a convertible Mustang, and traveling down the Keys. Our first night in balmy Florida we were in Miami Beach, enjoying the sunset, sangria, and lobster poutine. Traditional poutine is a Canadian dish of french fries, cheese curds, and gravy. 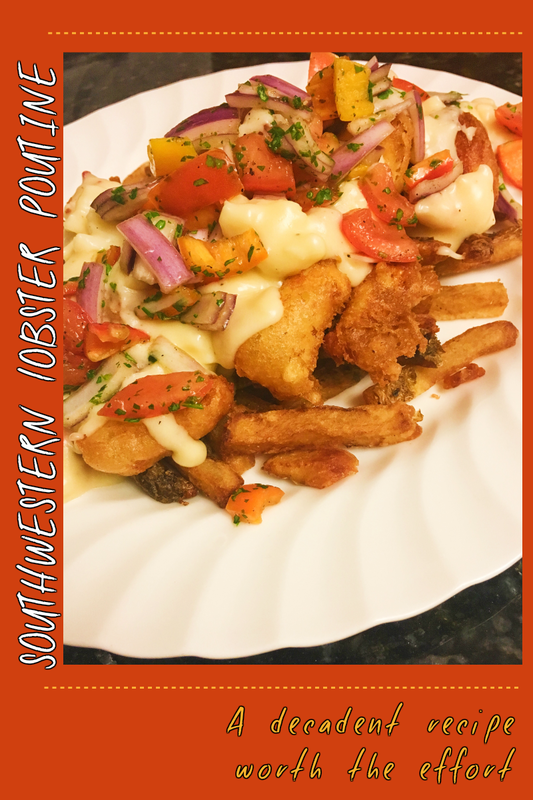 Our Southwestern Lobster Poutine recipe is a fusion of that delicious poutine and Mrs. Awesome's heritage as a Southwestern girl. 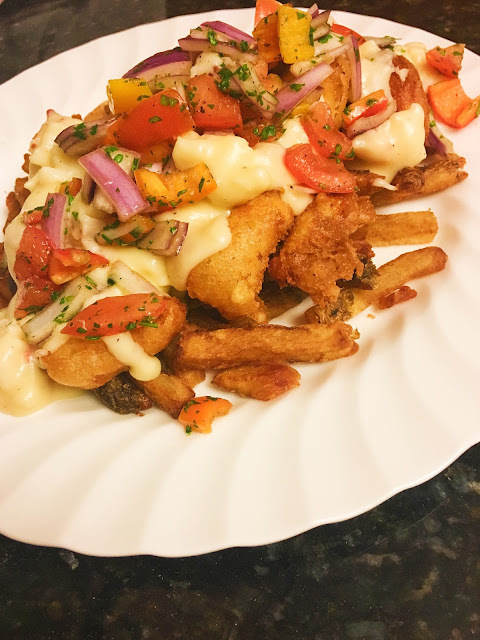 As you may have noticed from the photo, this dish is not for the calorically frightened, combining french fries, fried cheese curds, and cheese sauce. Mrs. Awesome showed some restraint by not adding bacon crumbles, which were considered. The flavors are brightened with a quick salsa. We hope you'll enjoy this decadent take on the classic poutine. Leave us a comment and let us know what you think. This recipe will take a little organization in order to pull off, but don't worry, we've got you covered! Work through each component in the order listed, and it will all come together! Of course the more people you enlist/conscript/cajole into helping cook, the easier it will be! 1. Scoop the disgusting guts out of two tomatoes (Mister Awesome, being all cheffy and stuff would say concasse the tomatoes, but whatevs... and leave the skin on) and the seeds from the bell pepper. 3. Mix in a bowl with the remainder of the ingredients and adjust seasoning to taste. Set aside to allow the flavors to marry while you prepare the rest of the dish. 1. If you bought already cooked fries, keep them warm in a 200° F oven. Otherwise prepare according to packaging or get to chopping your potatoes and make those fries happen. 1. Make a roux by melting the butter in a medium sauce pan over medium-high heat and then whisk in the flour. Cook the roux for about 10 minutes, you don't want it to brown- just cook the raw taste out of the flour. 2. Slowly add the milk, about a quarter of a cup at a time and whisk it until the roux is smooth again before adding more. If not, you'll have a lumpy bechamel (bet you didn't know you were making one of the six "mother sauces"). 4. Add the chopped lobster. Keep the lobster sauce on a medium-low heat, just below a simmer. You're poaching the lobster which will both cook it and infuse its flavor into the sauce. Stir occasionally and add a little more milk if the sauce becomes too thick. It should be about the consistency of a thick gravy. 1. Put 32 ounces of canola oil a saucpan pan on medium high heat and let it heat to 375° F.
2. While the oil heats make the batter by whisking together everything but the curds in a big enough bowl that you can drench the curds in it. the oil isn't proper temperature. 4. Drop about 1/4 of the curds in the batter, and using a slotted spoon, stir them to coat. Scoop them up and shake some of the excess batter off before carefully dropping them into the hot oil. Pay attention to the temperature, turning up the heat on the stove top if you don't have a fryer to minimize the temperature drop. 5. They'll cook in about 30 seconds or so, look for desired level of brownness, use another slotted spoon or a strainer to scoop them out and place the curds on a paper towel lined plate. 6. Wait for the oil to come back to temperature, then repeat. Place each batch of the finished curds in the oven to keep warm. 4. Complete with a few beautiful tablespoons of the delicious salsa.